How good is Diamondbrite? 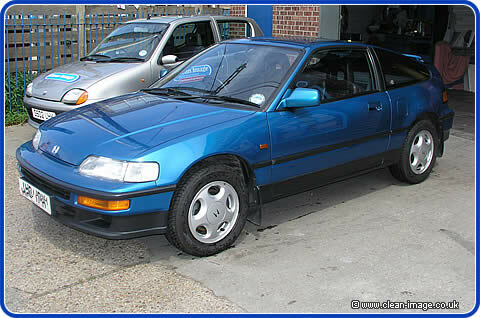 This 15 year old CRX is in superb condition! A little while ago a customer brought a brand new Honda NSX to us... in fact we were his very first port of call! The car was the very last one ever made which makes it somewhat unique and Mr Hurlstone picked it up and brought it straight to us for a Diamondbrite treatment. The very last NSX to ever roll off the production line at Honda. We had the pleasure if treating it with Diamondbrite. So we got chatting with Mr Hurlstone and obviously the subject of Diamondbrite came up and we were singing it's praises, and telling Mr Hurlstone what a good choice he had made and how long it lasts... it turns out that we were preaching to the converted! 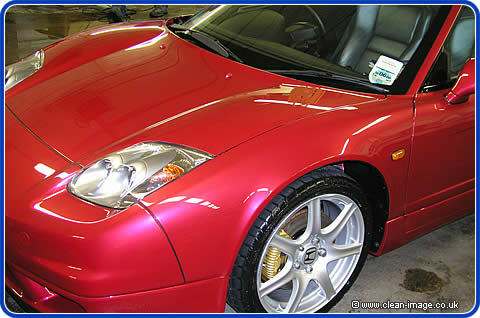 He mentioned that he had a Honda CRX which had been treated with Diamondbrite 15 years ago and it still looked good. 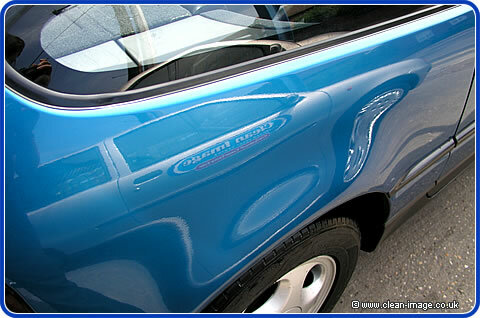 We knew that sealants can last a very long time, much longer than the guarantee if properly cared for, but obviously people don't often keep cars for more than the 6 years that Jewelultra promises that Diamondbrite lasts, so it's very hard for us to keep an eye on a car for that long to see what happens. So we though this quite an exciting opportunity.. we phoned Jewelultra and they thought so too! Despite Gary having his knobbly knees on display, Mr Hurlstone was kind enough to bring his CRX to us. 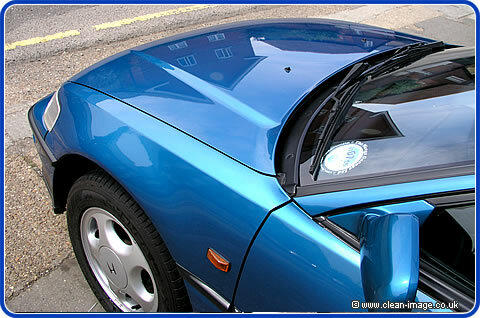 In fact, Jewelultra were so pleased at this customer's loyalty that they gave him free tickets to the MotorShow and paid for him to stay at the Riverside Hotel overnight while we gave his CRX another free treatment of Diamondbrite. 15 years old and 80k on the clock. 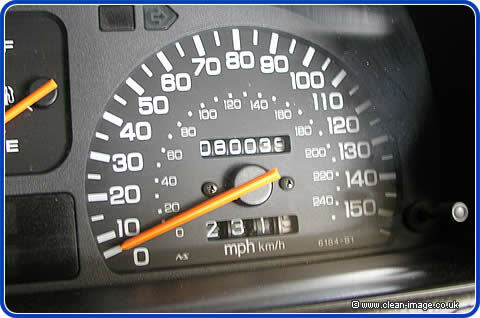 This car has been garaged for the last few years but has been regularly used throughout it's life. We were really impressed when we saw the car... it really was in superb condition for it's age. What would you expect of a car this age? Well it wasn't like new -- it has done quite a few miles and has plenty of stone chips to show for it. It also had a couple of dents which Mike did his best to remove. Mike removes a couple of dents on the bonnet. One was quite severe and he was only able to make an 80% improvement, another was removed completely. Still shiny after all these years! Despite some stone chips and a couple of dents mentioned on the previous page, the car really was in excellent condition. 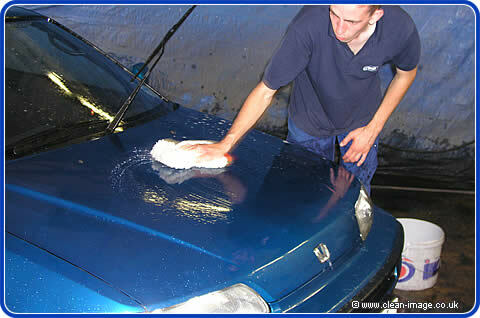 Since the car was new and treated with Diamondbrite, Mr Hurlstone has cared for the car as-per the Diamondbrite instructions, regularly washing the car with Diamondbrite shampoo and conserver - but never waxing or polishing the car. Kiran washes the car with Diamondbrite conserver . So we decided that we would first do the same, we gave the car a wash and then sploshed on some conserver before giving it a rinse off with a hosepipe. The handsome young man pictured above then dried the car with a microfibre cloth and parked it outside in the sunshine for us to look at (despite being in the middle of a heat wave, typically it clouded over and there is no sunshine!). The CRX after a quick wash with Conserver. I inspected the car closely and quite honestly say that I have seen cars a year old that are in worse condition. There is no fading, hazing, cloudiness or oxidization on the paintwork at all - in fact, I couldn't find a single rust blister on the car! (Mr Hurlstone has taken great care to regularly touch in any stone chips). Despite it being a cloudy and hazy day, you can see how reflective the paintwork is. Of course, the paintwork isn't perfect... after 15 years of regular washing, the car had micro-scratches (tiny scratches which look a bit like cobwebs when they catch the light, which is why they are sometimes called spider-webs) but I have seen a lot worse on cars that are only months old. The micro-scratches weren't bad enough that I could get a photo of them. You can see the reflection of the house in the bonnet. It's pretty clear but after we machine polish the car it will be even better. I have to say that I was also impressed by the state of the trim. With no waxes or polishes ever used, they hadn't ended up on the plastic trim or rubbers, and the conserver, which is basically a wash'n'wax which contains a synthetic wax matched to the Diamondbrite coating, kept the trim looking bright and black (if that is not a contradiction in terms... you know what I mean!). I can only say that it is a shame that they didn't do wheel sealants 15 years ago because the alloys were looking a little bit dull and stained. But we have cleaners that can improve the way they look. Unfortunately we couldn't do anything about the rust blisters on them - it goest to show that while the paintwork looks great, other parts of the car had aged somewhat. Honda Civic Type R Build your own Honda Civic Type R online at Honda Car UK. We love Honda's at Clean Image (we love most Japanese cars). Use the link above to visit the Honda website and build your own car... it's fun.